To learn more about our coaches, click the boxes below. Home: I was born and raised in Cleveland, OH. I live in Plainfield now. Family: Wife, Jen. My three children: Jack (13), Maddie (12), and Sam (10). My three step-children: Kate (17), Lauren (13), and Madi (10). CrossFit Level I certificate: October 2017. 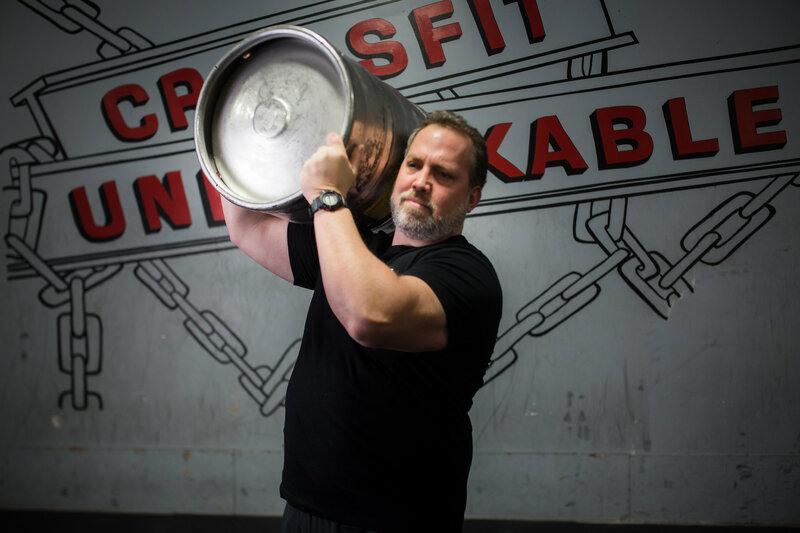 CrossFit Strongman certificate: May 2016. At 41 I look back on my life and it’s easy to recognize that I was always drawn to sports. For most in my family, it was never a priority. But I would somehow try to find a way to better myself physically in an attempt to be a better athlete. My athletic path was unusual and I played an uncommon sport, racquetball through middle school and high school. I was a former college racquetball player at Purdue University in the mid-90’s. After several back injuries, I could no longer play racquetball and started down a very unhealthy lifestyle. Fast-forward 15 years, and my weight ballooned from 190lbs to 300lbs. I was on TRICOR medicine, snored terribly, had incredible back pain, and with 31% body fat was quite obese. In 2010 I started on the P90X program and had some success, lost weight, and got stronger. I then bought a Vitamix blender and started learning about a paleo diet and had more success. My gym offered group classes that people were calling CrossFit. I continued in those classes through 2011 and had more success. Then in 2012 I searched out and interviewed several CF boxes in Indianapolis. I finally settled in with CrossFit Naptown and trained there through 2012. Now I am the healthiest I have ever been. I have been an entrepreneur for my career, have my MBA from Purdue, have owned a painting franchise, worked as an investment broker, ran a division for a state agency, etc. I knew in 2012 I wanted to own and run a box. Consequently, I sought out the best box in Indiana, and selected CF Naptown. The owners there have helped me grow as an athlete. They also have been mentoring me along the way on the coaching and business side of things. I wanted to experience a self-made internship before I felt comfortable operating a box. In my quest to learn about operating a box, I have visited over 20 boxes in 5 states, creating my own network of teammates for sharing ideas for running my box. I have been able to share my knowledge and pick up things from others too. I’ve competed in local CrossFit, weightlifting, strongman, running, and triathalon competitions. I’ve also judged in them as well. I also went to the Central East Regionals in 2012. In addition to CF, I try to expose myself to even broader forms of fitness: SEAL Fit, distance running, power lifting, boot camps, triathlons, weightlifting, powerlifting, strongman etc. I love helping others become healthier. It is tremendously rewarding and is truly fun for me. My goal is for my athletes to adopt a mindset that this is a lifestyle. There are no short cuts. Hard work, strong habits, and solid coaching can enable athletes to do 10X more than they think capable. We have the best fitness facility in the county and we want to improve significantly from there. What are your three favorite movements? I love the olympic lifts, anything unusual like flipping tires and pushing sleds, and sand bag work, anything heavy. 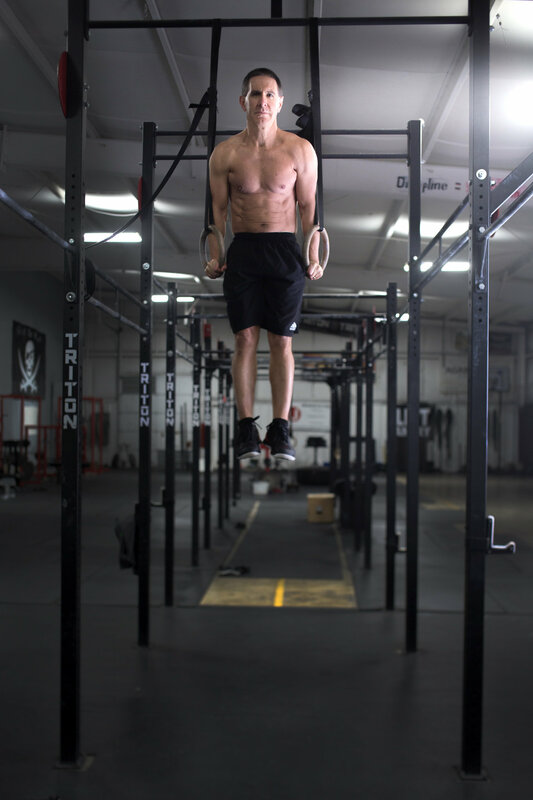 What is your favorite CrossFit WOD? Fight Gone Bad, Murph, CFU Monthly Challenges. What is your least favorite movment? Toes to bar and hand stands. 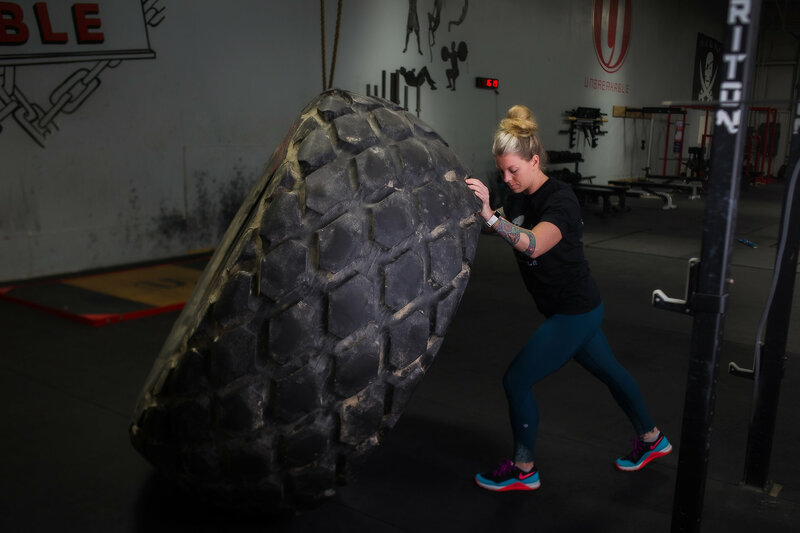 What is your least favorite CrossFit WOD? Most WODs with skillwork are not my jam. But it all simply become training with a new target. And new targets are fun. What are 3 fitness goals you have for the rest of 2018? 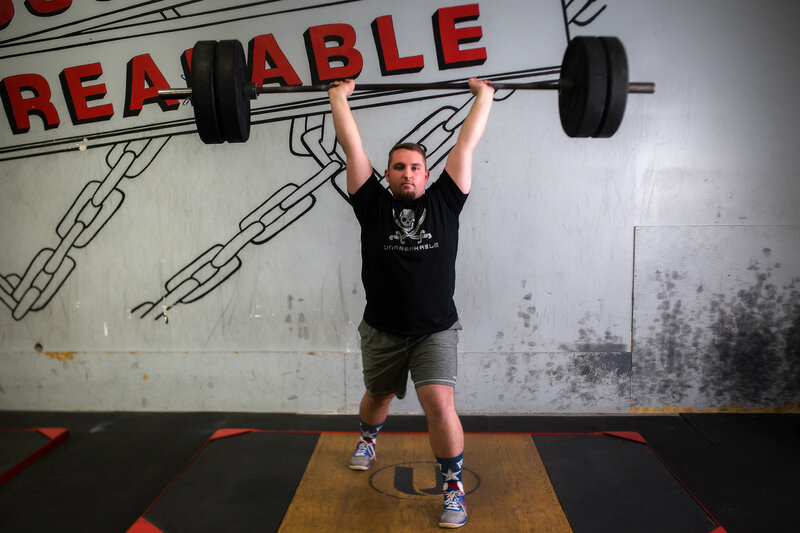 Compete in the Blind Dog Highlander, back squat 500lbs, compete in a powerlifting meet. What are 3 coaching goals you have for 2018? Become USAW certified. 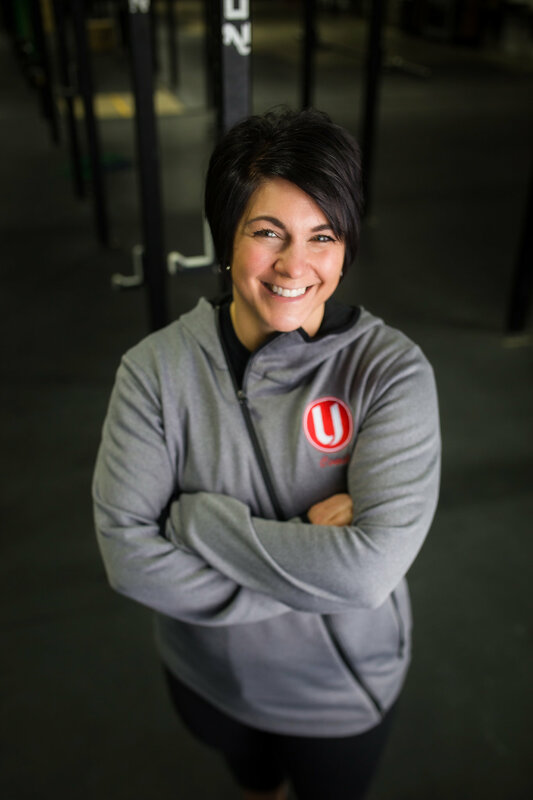 Kelly has been with CFU since the early time when it opened. From the beginning, over the years, now, and in the future, Kelly has consistently made improvements. She has trained consistently week in and week out and has come a long way as an athlete and a coach. Often times, she is the first person a new athlete meets because she conducts so many Intro Classes. 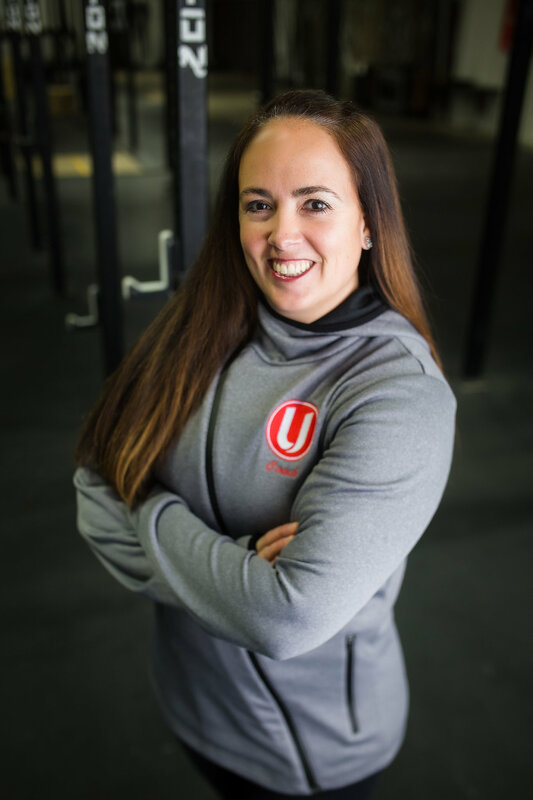 From their you’ll find Kelly conducting the standard CrossFit sessions, Fundamental Classes, and the occassional one-on-one session. She’s excellent at making sure our athletes understand the fundamentals and are moving correctly. And thankfully she has no problem cranking up the intensity in order to get the most of our athletes. Afterall she has the Unbreakable mindset in order to coach with us. “we’re gonna need a bigger boat” – with a family of 8 + 3 dogs you can substitute about anything for boat. Like most, I was an athlete in high school and went away to college, and quickly became busy with life. Little did I know that I wasn’t busy at all. The busy started in reality as I held a full time job/career with 3 small kids. As a nurse for Merck I began putting myself last on the priority list as moms often do. After I had Madi I decided to start doing something for myself – working out. I started slowly at the rec center taking group fitness classes. I counted myself lucky to have found a group of ladies that held me accountable and encouraged me. Next thing I knew we had all signed up for a sprint triathlon. One race led to another, and before I knew it I was running half marathons. All the while I had known about CrossFit through my cousin who was a CF-L1 in the early years of CF. CrossFit was something I always longed to try, but there was a little voice inside me that said it was going to be too hard. That voice won for much too long. One day I finally faced my fear, told that voice to shut up, and walked through the doors of CFU by myself. I even remember my first workout – Tabata. I couldn’t walk for a week. You can say the rest is history. 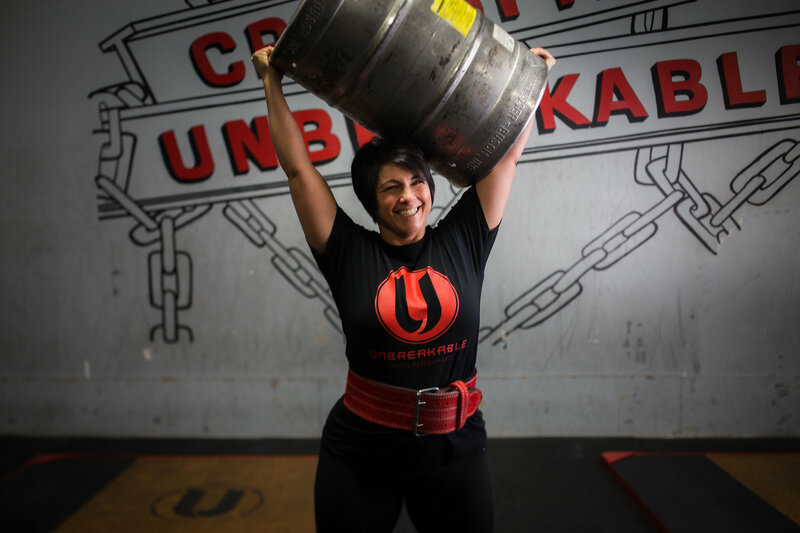 I not only fell in love with CrossFit and the CF community, but also discovered powerlifting and strongman. 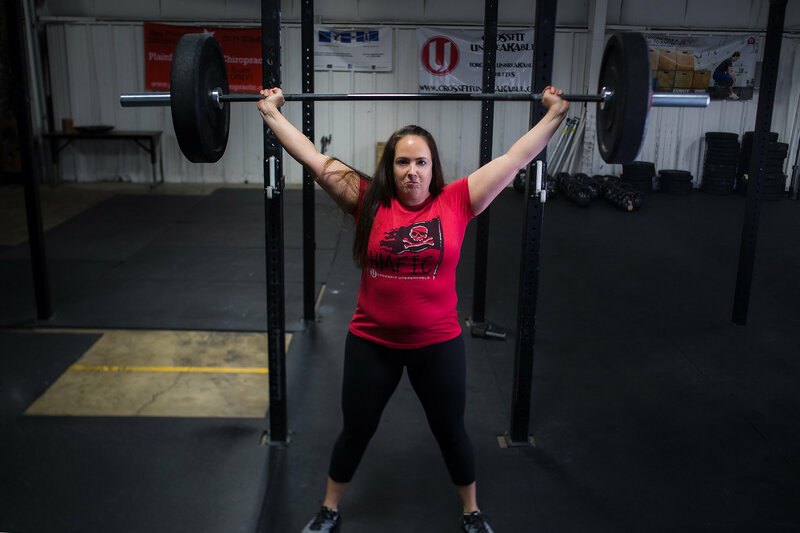 I love the confidence that people gain through CrossFit – doing things they never thought they could do. It’s been great, and I’ve never looked back. From a very young age, Rob has developed a love for competition and camaraderie. After nearly 40 years of participating in or coaching seven different sports, he still has the desire to compete in everything he does. In 2015 his daughter, Jessica, became an intern at Crossfit Unbreakable. She knew crossfit was the perfect challenge for him and convinced Rob to give it a try during the summer of 2015. She was right! 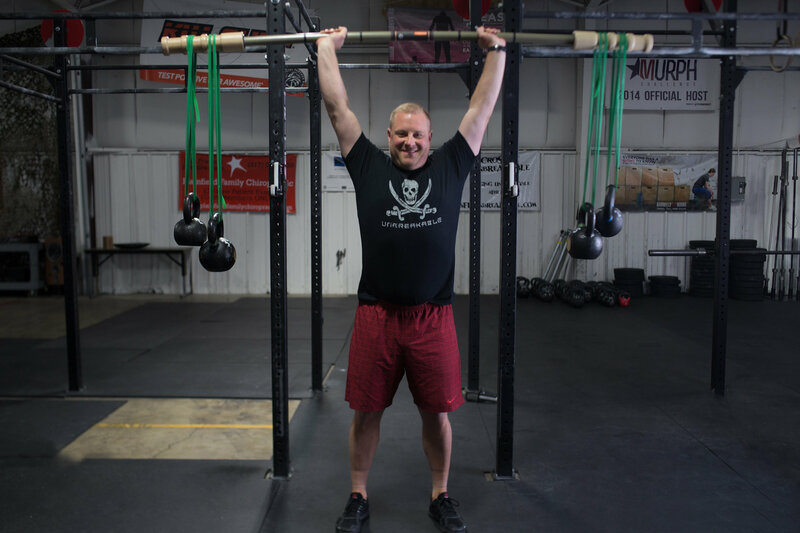 Crossfit has provided Rob with all the same opportunities for competitiveness and camaraderie that team sports have offered him. Combining both of those with his love for fitness was a perfect blend. 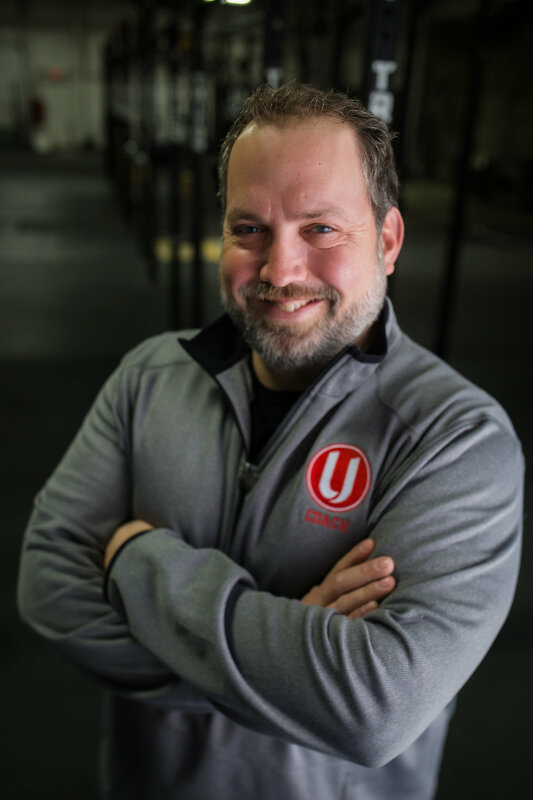 In early 2017 Rob was given a chance to coach at Crossfit Unbreakable, and after briefly thinking about it, he knew he couldn’t pass up an occasion to work with like-minded people. He has a never-quit attitude that becomes contagious. It’s his positive attitude toward goal achievement and his enthusiasm for fitness and a healthy lifestyle that Rob wants to share with others. 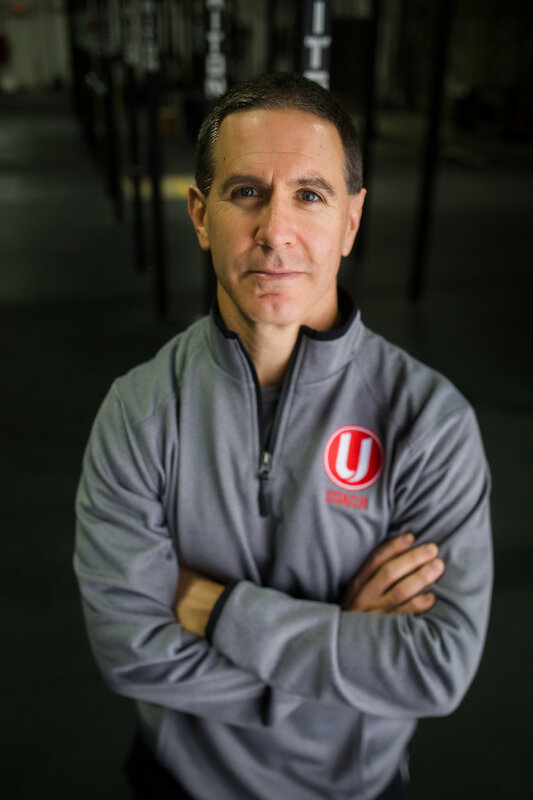 In July 2017 Rob was given another opportunity – to work with young athletes on the Crossfit Unbreakable Sports Performance team. He believes that through personal integrity, discipline, and dedication any athlete can attain his or her goal. He wants to thank his wife, daughter, and parents for inspiring him and for showing him that hard work pays off. He also wants to thank his crossfit friends for pushing him throughout every workout. Chad Dockery begins his 19th season as a strength coach. Prior to arriving at Unbreakable Sports Performance Dockery was the director of strength and speed for the Mooresville Consolidated School District, head football coach, head track coach and health/P.E. department chair where he oversaw all varsity sports. During Dockery’s tenure at Mooresville athletes broke every record in the weight room and most importantly Dockery began tracking and recording female records as well. Dockery also oversaw a complete renovation of the weight room facilities from the flooring to the equipment used to train athletes. Dockery moved to Mooresville after 4 years as the strength and speed coach, head football coach, and head track coach at Woodmont High School in Piedmont, South Carolina. Before joining the Wildcats; coach spent 5 years working as the offensive coordinator, strength coach and head track coach at Berea High School. Coach Dockery’s first coaching stint in South Carolina was at Wade Hampton High School as the offensive and defensive line coach, strength coach, as well as the special teams coordinator. Before Coach arrived in South Carolina he spent 4 years working at his alma mater; Evansville Memorial as a varsity assistant, head freshman football coach, head track coach and strength and speed coach. Coach Dockery is certified as a Speed and Explosion Coach by The National Association of Speed and Explosion. After the regular season ends he stays very involved with coaching football through speaking at clinics and working as an instructor at camps. Coach Dockery has worked the Bishop and Dullaghan Passing Camps, USA football coaching schools, and with the Chicago Bears.